Our Banana Hook goes up, up and away! It's self-adhesive to attach below a cabinet - the bunch of bananas hang to ripen. No more bruises and soft spots caused by resting on a hard surface. When the last banana is gone, the hook folds flat to stay out of sight! Banana Hook is rated 4.0 out of 5 by 27. Rated 1 out of 5 by mozart from self adhesive not strong I saw this product and loved the idea that it folders when not in use but the adhesive did not hold at all...disappointed until i can find another way to keep it attached to the cabinet. Rated 5 out of 5 by gloraya from Best little idea ever! I have purchased several of these hooks.I absolutely love them. I grow bananas and always need a place to hang them. This is out of the way and does not take up counter space. For the people who complain that the sticky tape is no good, I believe the sticky is to hold it in place for you to put the screws in. I can't imagine anyone thinking a piece of sticky tape with support a bunch of bananas. Rated 4 out of 5 by Anbayer from Nifty Object Great buy for the price. Keeps my counters clear by hanging the bananas. I like empty counters. The hook folds excellently when not in use. The only thing I recommend is to use the two pre-drilled holes and screw it into the underside of your cupboard. The sticky pad that comes with it did not work. Our 3 bananas fell and bruised. Easy fix though. Rated 5 out of 5 by MellyC from Sturdy and not an eyesore Was surprised at how sturdy this is. Love how it can be folded up when not in use. Great price too! Rated 5 out of 5 by ingyo from Love this! I hate when I see a piece of furniture for storing bananas, this is not the case, when you need it its there when you don't it flips up and away. I have recommended this to all my friends and even have purchased them for gifts...This is on my favorites list!!!!! Rated 5 out of 5 by lilfish from I can't believe it holds with just adhesive! I love that I can tuck this away when we do not have bananas to hang. My expectation was that I would have to use screws since bananas are a little heavy. To my surprise, the adhesive has held for months, and we typically have bananas hanging 5 out of 7 days of the week. I did let the adhesive set for a couple of days before using it the first time. Rated 1 out of 5 by MizzCarolyn from Never should have bought it I so wanted this to work out because I want to store bananas off the counter. Unfortunately it just didn't keep the bananas up. I cleaned under the cabinet but it just didn't stay. It came off pretty quickly. Rated 3 out of 5 by KiraKira from Great idea, needs extra adhesive I bought this hook about 6 weeks ago and love it, but it just fell down this week. Since that seemed to be an issue with other reviewers, I cleaned the underside of my cabinet with rubbing alcohol, let it dry, attached the hook, then let it sit for a few days before hanging any bananas. When the hook fell, no one was grabbing bananas/accidentally knocked it/etc. -- the adhesive just didn't seem to be strong enough. Unlike other reviewers, I won't be buying this product again if I can't re-adhere my current hook. Spending $5 every 6 weeks just to hang my bananas seems a little ridiculous, even if it is cheap. Rated 4 out of 5 by Jill429 from Counter declutter With all the cooking I do, I hate things cluttering my counter. This keeps the bananas in view so my children will eat them and out of my way when I'm cooking! Rated 4 out of 5 by mo40213 from space saver I love that this keeps my banana off of my counter and saves me space. Rated 5 out of 5 by MelissaGail from Fresh I love this hook..It disappears when you don't use it and it keeps your bananas fresher and not sitting on the counter. My whole family uses them. So simple and effective. Rated 5 out of 5 by JoKay from Small and Prefect Love this little hook. Work great to get banana's off our counter and keep them from bruising. I give them as gifts all the time. Everyone loves banana's and now they are out of your way but, in great shape. The hook just flips up when you don't have banana's in the house. Get one today!! 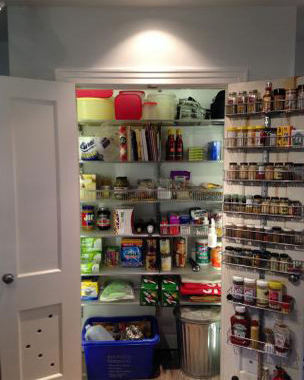 Rated 4 out of 5 by MommaBecks from Space Saver This replaced a countertop storage for us, and has saved a ton of space. I love that it folds away when not in use. Plus, it makes the bananas ripen evenly! The only downside we've found is that the last banana ends up sitting on the counter since we can't hang it back up. Rated 5 out of 5 by SunnyInCo from My favorite Container Store purchase This is our most used item from The Container Store. So useful and simple...and I love that you can hide it out of the way if you don't have any bananas. And we consistently get positive comments from house guests who ask where we got it. I can't understand the one star review...we've had ours securely hanging in place for 6 years now without any problems. Rated 5 out of 5 by katie2blue from neatest inexpensive product This product is one of the most inexpensive but neatest items in my kitchen. It fulfills a need and keeps my counter free of clutter. Searched for this banana hook in many places and was so pleased to find it in The Container Store. Rated 5 out of 5 by sakb from Awesome space saver I don't know why other reviewers had trouble, but ours is great. I stuck it under the cabinet and figured it was going to fall and I would have to use screws -just figured I would try that first- and it has held. Over a year now and it still works great. I love that it folds out of sight. Rated 1 out of 5 by MamaCool from Don't waste your money! I've read the other reviews saying it wasn't a good product but still wanted to give it a try. I really wanted it to work as I hate having things on my kitchen counter. Well I cleaned the surface, glued the hook on, waited five (!!!) days before hanging bananas on it... and it fell off after two minutes. Good idea, bad, bad, bad conception. Rated 5 out of 5 by dlyTX from Must Have You don't even know it's there unless in use. No wasting counter space with large banana holders. I bought several and am giving them to family & friends. Rated 5 out of 5 by Koalaseahorse from Best Find The banana hook was a great purchase! It was inexpensive, it keeps our bananas bruise free, it's off the counter, and folds out of sight when not it use. Rated 1 out of 5 by 30FfromMD from Does not work! I followed the instructions on this product and cleaned off and dried the surface area first. Then I stuck it up underneath the cubbard and I held it for a long time to make sure it stuck (probably 2 minutes). Then I waited a while before I actually put our bananas on it. We had 6 bananas and put it up onto the hook then left to go play games in our living room. After about 10 minutes we heard a thud from in our living room. I went into the kitchen and the entire hook had came off and the bananas all got bruised. I was highly disappointed. Do not buy this cheap product - gravity will pull it right off. It is a stupid invention really. You'd be better having a giant superglued magnet underneath your cabinet and then having a magnetic hook. Rated 5 out of 5 by terryb from BEST PURCHASE EVER Never bought the regular sit on counter banana holder...think they are ugly...but this little gadget...well, it folds up and out of sight when not in use. Now my bananas get less bruised!!! I am one happy monkey!!!!! Rated 1 out of 5 by CSingh from Bad investment A real let down, 4 bananas were too heavy for the hook and would fall off and bruise. Beats the purpose of buying this. Instead of hanging bananas, I used it to hang my shower cap and loofah in the shower. Rated 5 out of 5 by messymom1 from best purchase ever I hate brown bananas and this solves the problem. Very sturdy to even hold a large amount of them. This tucks away when they are not in need out of sight. How long is the Banana Hook? I just measured mine and it is 5&quot; long from the hanger to the bottom of the hook part. The width of the plastic hanger is approximately 1/2&quot;. The hook from the outside side to outside side is 2 1/4&quot;. The inner crook where the bananas hang is 1 1/4&quot;. That's wide enough to hang up to 6 or 7 bananas depending on the size of the bananas. Hope this helps. I have read that the adhesive is not very good. As i live in a rental apartment i do not have the option of screwing this into the bottom of my cabinet. Any suggestions how i can still use this item? I've never had a problem with mine and I don't use the screws. Their problems could have been the surface they were trying to stick it on. These adhesives don't seem to do well with glossy or slick surfaces. You might try cleaning the area you're going to use with soapy water to remove any grease or oils, then go back over it with a paper towel and 50-75% alcohol. Stick the adhesive on the hook and press the hook up on the cabinet pressing firmly for 30 seconds. It should work fine. If not, then you could always get you some of those replacement strips that holds up 5-7.5 lbs. And see if that won't work. Just be sure both surfaces are clean if you try the replacement strips. Good luck!